At IoT World in Silicon Valley, a United Parcel Service executive talks up the disruptive force of sensors, data and analytics. IOT WORLD — The color brown typically doesn’t inspire creative ideas or exciting technology, such as the internet of things (IoT). Yet it’s quickly taking on the bright hue of the future for the United Parcel Service (UPS). Known for its ubiquitous brown trucks, the global package delivery giant has embraced IoT in just about every facet of its business, with even more projects in the works. There are IoT sensors on trucks, handheld devices, even labels that monitor everything from truck engine performance to packages flowing through the network. IoT has already helped UPS save millions of dollars every year. One of the best-known examples of this is optimizing driver routes. Before drivers leave the facility, they get a manifest on their handheld devices that lays out their route for the day. It’s a route that factors in numerous data signals in order to minimize the miles they drive. Sensors also track location, traffic conditions, and monitor a truck’s performance to avoid breakdowns on the road. Inside the trucks, sensors monitor bulkheads and let drivers know if a bulkhead door opens and packages are at risk of falling out. Falling packages can lead to traffic accidents and hurt drivers. Packages themselves also have smart labels that track their whereabouts, enabling customers to receive alerts on when packages will be arriving. UPS can manage when and where a customer wants a package to be delivered. It’s a service called UPS My Choice, launched a couple of years ago, which now has 47 million subscribers. “One of the most ambitious IoT projects we’ve embarked on recently is the notion of having IoT devices connected to packages,” Perez said. Gazing into the future, IoT also sheds light on what customers crave. This can result in new services at UPS. 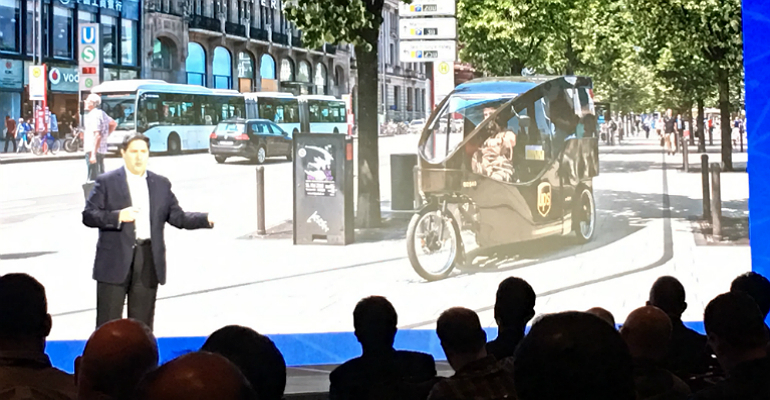 For instance, data collected from connected devices, and the insights gleaned from the data, has led to UPS introducing new capabilities in support of smart cities — namely E-Trike, a three-wheeled electric bike for delivering packages in urban settings.